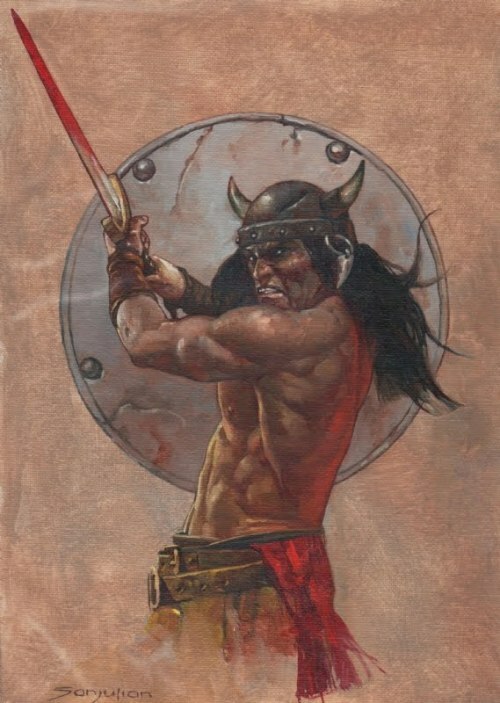 The Hyborian Age is dominated by men. Rarely is a woman described as all armored up, swinging a heavy sword, in battle, keeping their own, right next to men. It happens, sure, but it is rare. Valeria comes to mind—both incarnations of her (from Howard’s story Red Nails and the more battle oriented thief from the 1982 movie). Even then, it can be argued that Valeria (either version) is more of a finesse fighter than she is a strength fighter. Red Sonja comes to mind, too. But, Sonja’s power is imbued in her by her goddess. Her power is not natural. In spite of this, I don’t advocate using any type of modifiers for female characters. The same 4D6, drop lowest, total and arrange to taste process should be used for both female and male characters in this game. But, once the six totals are rolled, consider putting the lowest total into STR for female characters. This thinking will keep the gritty reality edge on the game that is a common part of the atmosphere of the Hyborian Age. This is not to say that the women of the Hyborian Age cannot be strong. They are usually strong in other ways. The Temptress class in the game is devoted to strong Hyborian Age women. When creating a sandbox, players are likely to go in directions for which the GM is not prepared. For that reason, I create contingency NPCs and encounters. Below, I have developed two Cimmerian NPCs. They're from the mythical north and have made it as far as Raize. They are clan-brothers. And, they don't speak the language. I put a lot of detail into these NPCs. This type of detail will help me use the characters in a wide range of circumstances. I get a feel for the people--who they are. I think, with these, I may have the PCs meet these two rogues early--maybe in a tavern, or on the road. Then, I'll keep them for the PCs to run into them a second time. For example, let's say that the PCs are thrown into the dungeon. Well, I can have one of these two Cimmerians already in the jail, and have the other engineer an escape--taking the PCs along with them. These guys can also develop to be foes. Let's say that the PCs sneak into a building in the city where I am not prepared. They can run into these two Cimmerians--maybe outside. Maybe inside, already robbing the place. Maybe the Cimmerians will tell the PCs to leave. The point is to have something that can be a very interesting encounter (and the detail lends itself to roleplaying) ready to throw into the game easily at a number of different places in the game when I need to buy time because the players have gone "off the map". I don't know how I'll use these two NPCs. But, when I need them, I have these two very interesting NPCs (who will be strangers in the south) ready to go. It took almost a season for Morghun to recover. Unable to move from his injuries, the cold months of the Cimmerian winter crept in and bit deeply into his chest. Spitting up blood and mucus, the wolf nearly killed him again, this time from beyond the grave. Many believed that Morghun would never see summer. But, the lad did. Finn Duncohr, the Foxman's chieftain, declared him to be named "Clanson" as Morghun had displayed the ultimate quality to which all Cimmerians aspire: He never gave up in the face of certain defeat. Though shallow on hit points, this character can be quite offensive in battle. He will strike with Stake, doing 1d10 +6 damage if he hits. He can use Power Attack to increase damage, if necessary. And, Stake is considered a finesse weapon (with an improved Armor Piercing rating of 3), should Morghun combat heavily armored foes. At the beginning or end of his turn--whichever is appropriate--he will use his 5 foot step to increase range to 10' in order to bring Stake to bear on his opponent. Morghun rarely relies on his dirk as a weapon, using more as a general knife and hunting tool. LANGUAGES*: Cimmerian (native), Nordheimer, Aqualonian, Pictish, Hyperborean. *This character is not literate in any of these languages. Literacy can be obtained at no cost to the character except for time needed to learn to read and write and an effort on the part of the character. Literacy actions are governed by the GM. BARBARIAN FEATS: Track, Two-Weapon Combat. **This Feat is taken from The Barbaric Warrior supplement. It allows the character to use the Fighting Defensively routine at a -2 attack modifier instead of the standard -4 penalty. BARBARIAN CLASS ABILITIES: Fearless, Versatility, Bite Sword, Crimson Mist. 20 skill points: 3 Climb, 1 Craft (Carpenter), 4 Listen, 1 Handle Animal, 1 Hide, 1 Move Silently, 1 Profession (Lumberjack), 1 Ride, 4 Spot, 3 Survival. NOTES: At 3rd level, look at obtaining the Great Fortitude Feat to boost his FORT save. Look at non-trained skills. At 4th level, as Cian gains a +1 bonus to any attribute of his choice, look at placing that in CON and gaining +4 hit points retroactively. On the journey from Seven Stones Ridge in the far north, Cian wears heavy leather breeks, deerskin boots, and a heavy cloth kilt. Up top, he wears a long sleeved cotton liene (billowy shirt). Around his shoulders, he wears his heavy bear skin mantle (heavy cloak). All clothing items are High Quality (Craft DC 15 to create/repair) except for the mantle, which is of Superior Quality (DC 20 to create/repair). See the clothing rules on page 3 of Tito's Trading Post. Miscellaneous clothing items include: Breeks and weapon belts. Cloth loinclout. Cian wears an Aesir mail hauberk, albeit dented, scratched, and repaired. The set fits well Cian's shape. And, the young warrior was proffered a new Asgardian horned steel helm. See the Armor section of the stat block above. When Cian became clansmen to the Blue Fox, he chipped a piece of stone from one of the teeth of the prachaun grule--the ancient circle of seven monolithic stones that gives the Foxman clanholme its name. This, he shaped into the image of a tooth. With a piece of gut leather, he hung it around his neck for all to see. As an animal bears it's teeth when it fights, so now would Cian, with a tooth of stone carved from ancient and sacred rock. When the Aesir presented Cian with the new helm, he had the stone tooth fashioned to a ring that hangs from the left side of the helmet. No longer would the tooth be hidden under heavy clothing or armor. All would see it when he donned the helm and entered battle. See the illustration of Cian above. Note that Cian will not always wear this armor, especially the hauberk. The mail sits heavily upon his shoulders causing fatigue. See the rule on page 41 of Tito's Trading Post. The only piece of true armor that Cian brought with him from his clanholme is the wooden targe for which he bartered just before leaving Seven Stones. Cian wears leather bracers on his wrists. These serve as armor (see the piecemeal armor rules in either the Barbaric Warrior or Barbaric Treasures supplements) but can only be combined with other piecemeal armor items. See the Armor section in the stat block above. As the Foxmen set off from Seven Stones, Hrathnar shoved a long, heavy war spear into Cian's hands. When needed, he was to use it to punch at the snow to ensure footing. War Spear: 1d10 Damage. x3 Critical. AP 2. Hard 7. HP 4. Reach/Finesse Weapon. Simple Two-Handed Melee Piercing Weapon. Cian's main weapon is an old, well-used broadsword that he's had almost as long as he's been a warrior. It's a no-frills, soldier's weapon that Cian took from dead fingers in the aftermath of his first large battle. Though plain, the weapon is strong, keen, and quite capable. There is no doubt that this is a warrior's weapon meant for the single purpose of slaying foes. Broadsword: 1d10 Damage. 19-20/x2 Critical. AP 3. Hard 10. HP 5. Finesse Weapon if wielded two-handed. Martial One-Handed Melee Slashing Weapon. Cian still carries the first real weapon he acquired as a child, long before he became a warrior. After his 4th winter, Cian's father gave him an antler-handled dirk. Today, Cian still frequently uses it as a utility knife and off-hand weapon. It is not balanced to be thrown. The dirk can always be found on Cian's person, usually in its scabbard at Cian's waist. The Cimmerian Dirk can be found in S&P. Cimmerian Dirk: 1d6 Damage. 19-20/x2 Critical. AP 2. Hard 10. HP 2. Finesse Weapon. Simple Light Melee Piercing Weapon. He wars a finely balanced axe to dispense his wrath. This weapon is carried with its handle through a metal hoop fastened to Cian's weapon belt. Axe: 1d8 Damage. x3 Critical. AP 1. Range Increment: 10 ft. Hard 5. HP 3. Finesse Weapon. Martial Light Melee Slashing Weapon. Cian's mantle features three inside pockets. He doesn't usually put anything in them as he's learned that any substantial weight throws his cloak askew. But, he does carry some flint and steel, and some fire starter made of dried brush, hemp, and horse hair. The weight of the cloak is much more substantial than all of these things combined (although there's plenty of room left in these pockets should he ever need them). On his belt (not his weapon belt) hangs a single pouch. In this, he carries a whetstone. Draped across his torso is a waterskin.